That my insights should be shared by all ! This poem is from the book Bal – e -Jibreel by Muhammad Iqbal, the national poet of Pakistan. Dr. Iqbal was one of the foremost thinkers and doers of his land of Punjab, formerly India, now Pakistan. Dr. Iqbal began his education at Scotch Mission College in his hometown of Sialkot,then did graduate work in Arabic and Philosophy at the Government College in Lahore. He also studied in England, earning a degree in Philosophy from Cambridge University, qualified as a barrister in London, and finally earned his doctorate from the University of Munich before returning to his native land where he practiced law, became a professor of Philosophy and English Literature, and produced poetic and philosophical writings that not only inspired people in their everyday lives, but contributed to the independence of Pakistan from Indian control. Besides being proclaimed the official poet of Pakistan, born in Sialkot, known in Southern Asia as the City of Poets, Dr. Iqbal collected a raft of titles along the way, a testament to his importance in the academic world as well as Pakistan’s struggle for independence. He earned the title Dr. for his academic work…he was knighted, and became a Sir…he was one of the most revered leaders of his country’s independence movement, hence Sahib, and a towering figure in Asian literature, adding the respectful title of Allama to his credentials. The picture above is my friend, the young Pakistani poet Maryam Shabaz, before a mural of Dr. Sir Sahib Allama Muhammad Iqbal. Maryam is a new voice in Pakistani and world literature, her first collection of poetry, The Light Behind the Veil from Multani Press, is due to be released soon. Maryam is a young woman I met through a social media site, but has become much more than a cyber acquaintance…more than a friend – mi hermanita…my little sister. I asked her to travel around her hometown of Sialkot, Pakistan – the City of Poets – and take a few photographs so I could write a post or two about her life as a young woman living in Pakistan, and the history of poetry from an area of the world where poetry is not only beautiful words meant to entertain, but essential food for the soul. I am going to be doing a series of posts on Allama Iqbal, Maryam, and Sialkot…the City of Poets. Maryam made a pilgrimage to Allama Iqbal’s former home, now a shrine and museum. Cameras are forbidden in the revered site, but Maryam explained to Mr. Riaz, the caretaker, what she planned to do with the photographs, and he gave her permission that is not afforded others out of respect for Iqbal and his towering contributions to education, literature, and his country’s independence. 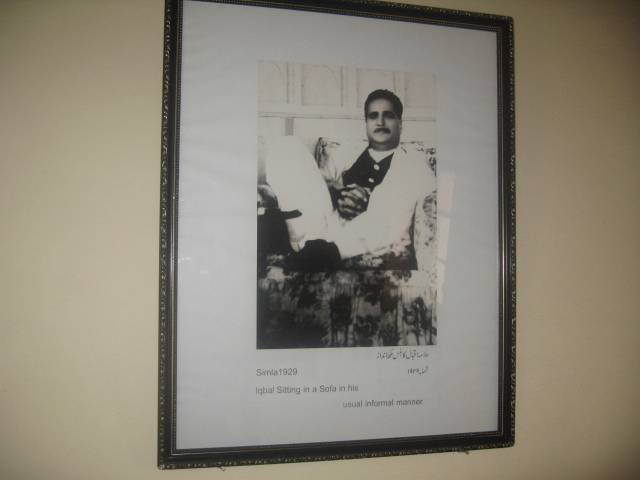 This photograph of Allama Iqbal hangs in his former home and current shrine/museum. It is one of the few informal images of him in his home. I’ll leave readers with another of Allama Iqbal’s sayings, one I had to have Maryam explain to me. You despise one bowing down, It frees a man from many bowings down. This confused me at first. It seemed as though the poet was implying that not bowing down to “the Creator” would save people from the many supplications to the Creator expected in the future. Maryam explained that what Iqbal meant by these words was that there are those who think bowing before the Creator is a chore they don’t need to follow, but that bowing down before the Creator gives the supplicant an inner peace and sense of empowerment that keeps them from having to bow down before mortal men in their everyday affairs. Sometimes I feel so ignorant. It’s good to have friends like Maryam, poets who are in tune with the power of words and their true meaning. More of Maryam’s trip through Sialkot and visit to the shrine of Dr. Sir Sahib Allama Muhammad Iqbal to follow…Inshaa-Allah, Dios quiere, God willing. This entry was posted in Books in Paradise, Photography, Social Media, Writings and tagged Books, History, Human Rights, literature, Pakistan, Photography, Reading, Religion, writing, Writings. A most wonderful, apt read about a legendary man in the words of the most amazing person. I seldom finds things which make my tears flow, but this, I am spell bound. You are a generous man, words here fall short, yet again. This is such a concise and at the same time, elaborate synopsis of a great man. No one could have done a better job ! Mucho gusto, mi hermanita. Saludos a tu familia, especialmente tu madre. City of Poets! I can imagine spending weeks crossing Hindu Kush, feeling like you’ll never reach civilization and the first city you come across is this mecca. That almost makes the whole trek through the wilderness and suffering sound romantic. Thank you for sharing this and I hope more is coming soon! Couldn’t believe it when I looked at a satellite image. There’s this city of 500,000 people on the border of Kashmir, massive ice-covered mountains, then a small town, nothing but desert for hundreds of miles, then another small town before Southeast Asia. i can totally understand crossing the mountains to get to a working flush-toilet. most people say they can rough it but after the third month one starts to feel nostalgic for indoor plumbing. Did the outhouse thing in central Alaska one winter. Nothing like digging my way to the outhouse after a snow…then shedding layers of clothing in 25 below. Chainsawing holes in my creek to lower a water bucket down for water for coffee made me appreciate indoor water. You seem like the inquisitive type…do a google map search of Sialkot, then pan to the right. After Kashmir it looks like the moon. Ai! What a wild world it looks like. They say not all who wander are lost, but perhaps they are simply looking for in-door plumbing, I know I have been. What part of Alaska did you live in? I’ve never been, but a nurse friend of mine just laughed when I asked what it was like and said, “the odds are good but the goods are odd.” That keeps making me laugh every time I hear it. Central Alaska, near Mt. McKinley. No address…just mile 34.6 on the Tok Cutoff. That post I did about My Radio Days was about that period of my life…the isolation-inpired radio show of ranting mad humans, many driven near-mad by that isolation. “Weird World,” quoth the Thompson. I agree. Words may be deeds – Aesop’s Fables. For the people of Pakistan, for all of us. Thanks. Strange to find a city on the edge of nowhere that produces poets, writers, philosophers, social leaders. I looked on a google map…Hindu Kush, then desert for hundreds of miles. One street out of town. It’s great to see a real side to the country and it’s people… Well done for posting that and good luck to Maryam! More to come. She is a jewel of a human being, and from a country whose people have been demonized. A little education and alternative information will at least illuminate who we’re told are “our” enemies. Thank you loads JC, Its real good to see the community of Scott coming forward and appreciating the ‘people’ of a country demonized, as he rightly says. It’s a pleasure and I do wish you the best of luck with your endeavours. Just ignore the media and do your own thing! I have to go check this out now. I have been taking a course in international literature and this looks amazing. Thank so very much for sharing it. Have to keep the wheels spinning. What happened to that beautiful photo/icon? Have you been taken over by Pod People? Thanks for stopping by..always a pleasure to hear from you. I changed computers lol I’m working on it!